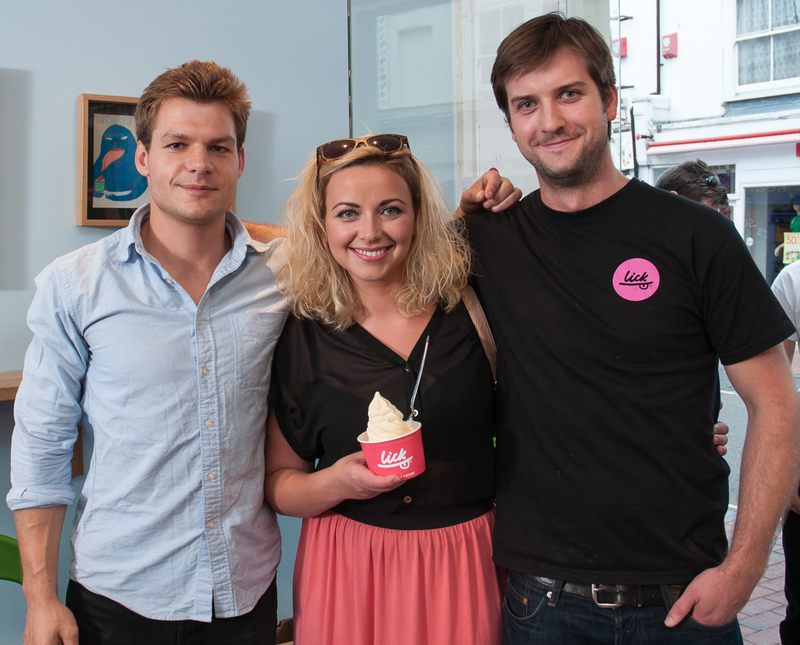 We were pretty lucky to be invited along to Lick for a fro-yo last week (okay, okay we invited ourselves) to chat all about their story behind the frozen yogurt. Those of you with any kind of connections with Brighton will know exactly who Lick are – and if you don’t, shame on you! 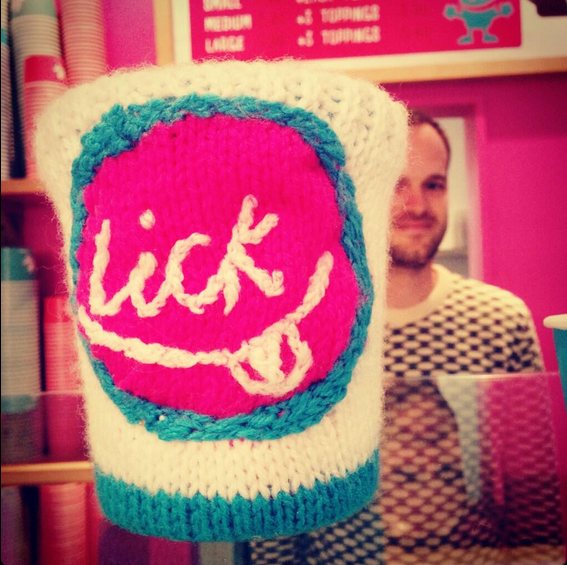 Lick sell the UK’s favourite frozen yogurt. They have stockists nationwide, but their one and only shop is based directly in front of the home of happy startups. And lucky for us they come and give us their leftovers, yum. 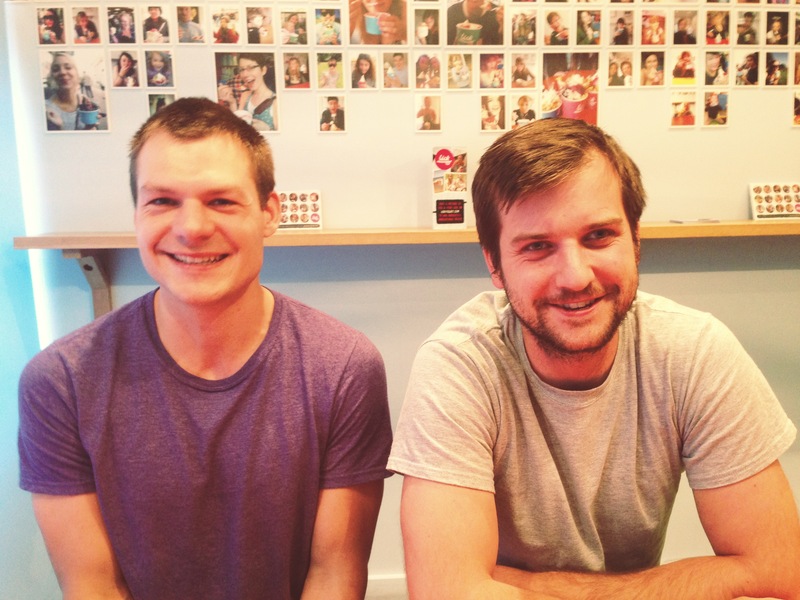 Ky & Owain the founders, have a pretty awesome story behind setting up their business. What struck me when I first met with them was how they’ve built their brand people have got to know and love over the past 10 years, almost purely through friendship. Their froyo days began one summer when the boys finished school. They looked for ways to earn money to tide them over during the holidays and came up with the idea of making all sorts of frozen yogurt flavours to sell down at their local beach in Tenby, Pembrokeshire. They used their savings to buy their very first shiny trike to sell the frozen yogurts from, and armed with a bunch of friends they hit the shores to share the froyo love. Business boomed, and after a successful first summer they bought their second trike and hit the beach with 12 of their friends to help keep up with demands – some who still work for the guys today (Tom, peeking out of the picture at the top, who takes care of all Lick’s social media, music events and branding voice has been with them from the beginning). It was a steady growth and after their fourth summer, business still thriving, Ky & Owain were keen to expand, applying for a lease of Saundersfoot beach allowing them to set up a bouncy castle, ice cream vans and deck chair hire, and pretty much had the run of the beach. The local ice cream man got a bit wound up, but everyone else seemed to be having a good time. In the early days, the frozen yogurts were produced with a good ol’ homemade trial and error approach. The guys (and their mums) would fix up fresh fruit mixed with natural frozen yogurt and dispense it into old ice cream tubs ready to dish out the morning after – very similar to todays recipe, only now with their 10 years more experience, they’ve worked on a secret lick recipe in their downstairs mini-factory to give it that real creamy taste it’s famous for. As Ky & Owain’s school years came to an end, they packed up the beach and moved to Brighton. They’d visited friends down here on plenty of occasions and loved Brighton’s happy, relaxed and experimental vibe. The North Laine in particular is a hub for independently run quirky shops and cafés, so to them it just felt like the right place to set up their first shop. 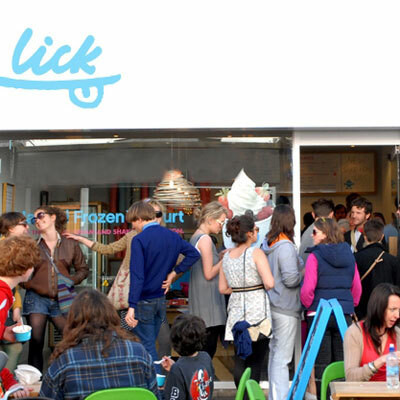 Their move to Brighton was a pivotal moment for Lick’s success. It was at this point they really started to think about branding the product and spreading the word on the flagship store. Their friends all helped out on making the move and the new Lick HQ a huge success. 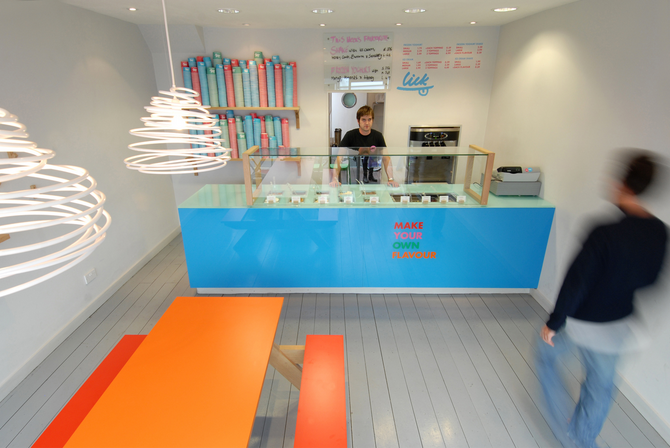 They always wanted the shop to represent exactly why they started making frozen yogurts down the beach in the first place – to create a place where friends could come and hang out – and this is something they put huge emphasis on when making business decisions. When they hire for example, they only hire people they genuinely like, people that aren’t forced who they’d happily go for drinks with. And similarly with their branding and marketing, they take a down to earth approach. It’s these decisions that make Lick a tight knit team, and make work feel like they’re just hanging out with friends, like it’s a second home. I chatted to the guys about customer service and product development. I’m already a convert though, they gave me a free lick t-shirt and tote bag when I first met them (legends) so it was really interesting to hear more on how they’ve focused on the quality of their products and in what ways they’ve built their big fan base from scratch. They place a lot of their efforts in making the shop a fun, cool place to hang out by hosting live music nights and doing online competitions, (their welsh charm even got Charlotte Church in the house do an acoustic set). Tom, Ky & Owain’s bezzy, told me all about the fun ways they give back to their customers. It’s fun events and gestures like these that secure them long term superfans. “We’re always talking to our customers on Facebook, Twitter etc – and of course in our shop. Quite often someone will write something amazing about us, and we’ll write their name down in our Book of Winners (kept at the till) so they can get a free Lick. Other times people have sent in drawings of themselves eating lick, sent us photos of Lick t-shirts they’ve made themselves, and loads of other things. For efforts such as these we will find a ‘mega-prize’ to send them. 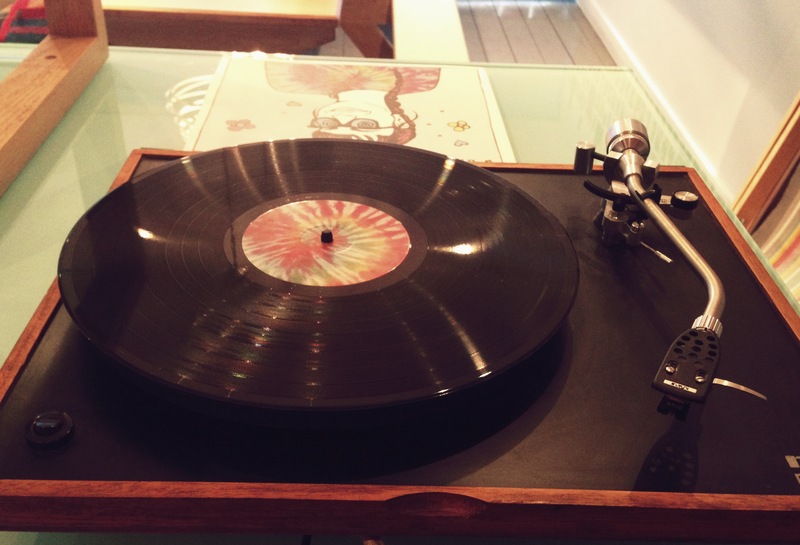 Recently we’re been giving away Lick albums – made up of tracks from our Lick sessions. We send out t-shirts, tote bags, vouchers etc – basically to anyone who’s taken the time to interact with us. The minute I stepped through the door to chat with them (shop was closed for the night, so no customers in sight) they had the music full blast clearing up after a hard days work – and the shop still had such a good atmosphere even with nobody around. 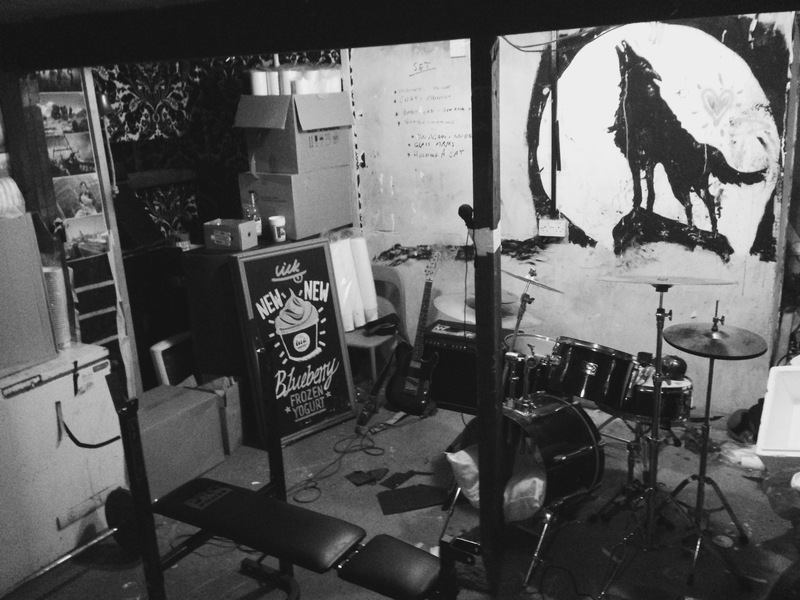 During their opening hours they support local bands by playing their vinyl to promote their music- it creates such a nice vibe, and on some nights they gather all their friends/staff downstairs for parties in the secret club under Lick (equipped with their own homemade bar, drum kit and weights, so they can pump iron if the mood strikes them). When it comes down to their company core values, a lot of it is left unspoken. Being human, talking like friends and leaving ego’s at the door definitely rang true, and they live and breathe this by working with the right people they trust and can have a laugh with. In terms of profit, the guys are doing exceptionally well. Aside from the shop, their pots are stocked in shops across the country – Wholefoods, Southern Co-operatives, LEON, Picturehouse Cinemas, National Trust, Ocado, Holiday Inn, Cook and over 100 schools & universities, and every penny in profit gets reinvested back into product development and upscaling production, so that every batch of frozen yogurts is better than the last. Happy customers! I managed to ask them what 3 things they’ve learned when it comes to building a business, and for such an on-the-spot question they did pretty well and came up with two gooduns to take away with you. Do it with the right people you trust and be prepared to work hard for it. Pretty sound advice. 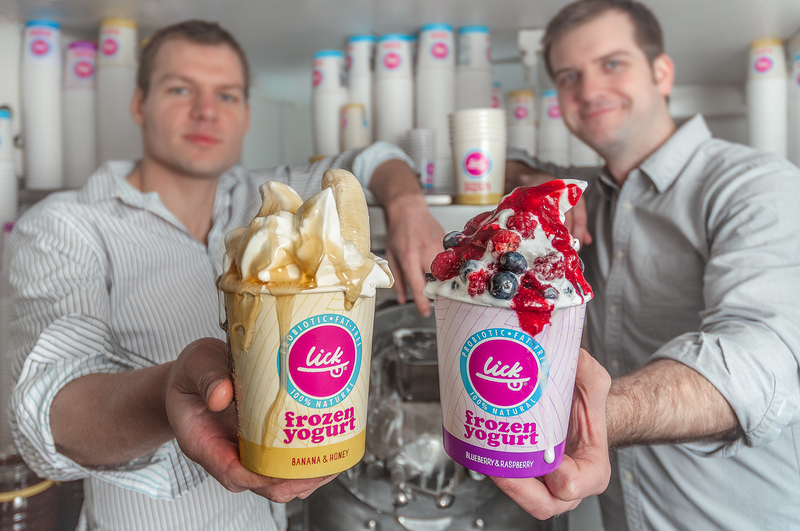 The guys have big plans for hitting Europe with their famous lick froyos; they’ve been in discussion with lots of european retailers so watch this space… but with just three of them (out from their shop staff) they’ve had to concentrate on the UK first – one step at a time. 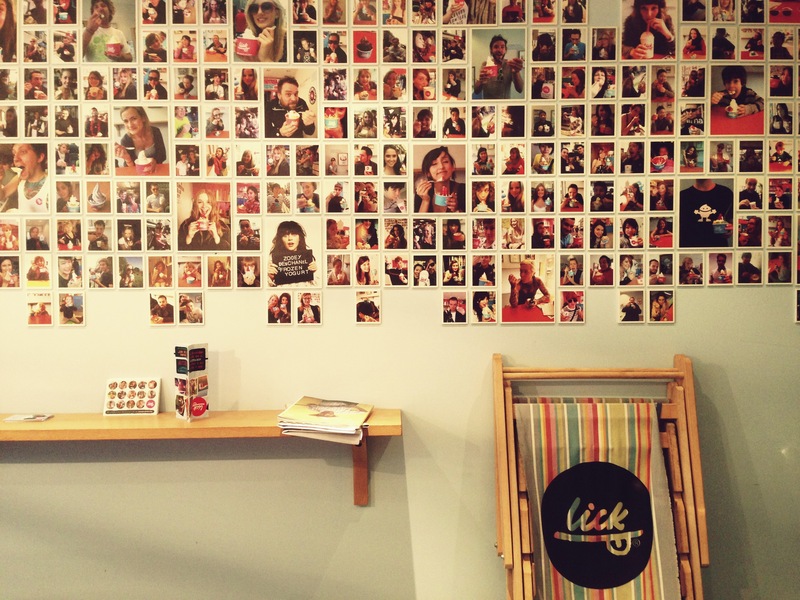 If you’re down in Brighton at some point this summer, pay these guys a little visit and upload your photo to their photo wall! You might win a penguin. Catch them on twitter & facebook too, they’ll brighten up your newsfeed.